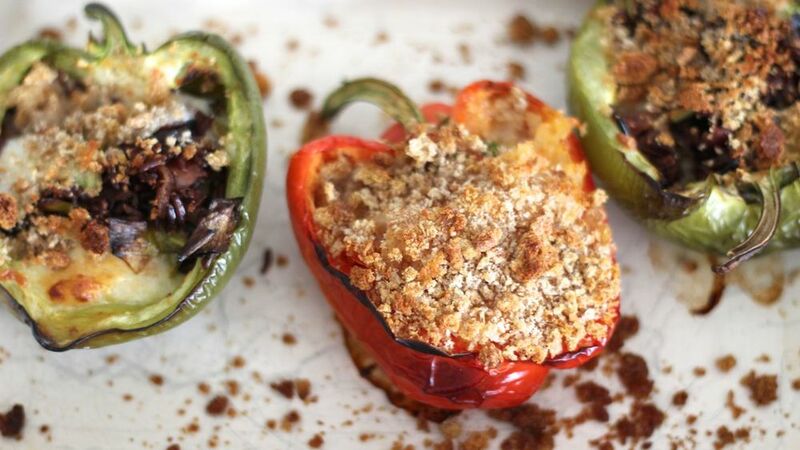 Stuffed peppers are one of the best ways we know to make a really appetising little meal out of leftovers. You can spoon anything into them: last night's ragu, recycled risotto, leftover lamb stew, caponata or ratatouille. Dot in a little ripped up mozzarella, sprinkle over some breadcrumbs and bake for a simple supper that's easy to serve in two sittings if one of you gets home late from work, or if the kids are eating separately. Serve alone in a bowl or with a garden salad and garlic bread. Even the littlest kids can do most of the prep for this with minimal hands-on help from you. 1. Preheat the oven to 200°C/400°F/Gas mark 6. Carefully slice the peppers in half lengthways (do this bit for them if they're little). Get them to spoon your chosen filling into the peppers, stuffing them about three-quarters of the way up. 2. Show them how to drain the mozzarella then get them to rip it up roughly and divide it between the four halves of pepper, pushing it into little pockets between the filling. Now they can sprinkle over the breadcrumbs, season with salt and pepper and grate over a little Parmesan cheese. 3. Bake in the oven for 40 minutes or until the peppers are soft, the filling is piping hot and the cheesy breadcrumbs are golden and crisp.